A couple of you have been wondering when I started working on my own patterns. The truth is, it just kind of happened. But here’s some of my advice to you. Never try and take on too much too soon. If you’ve never made a sweater before, don’t start making a sweater. I know it might seem simple but trust me you’re only going to frustrate yourself. 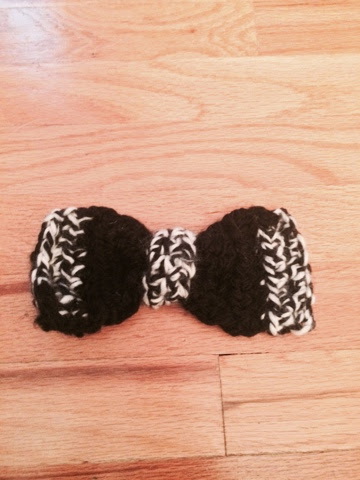 Make a scarf, or a hat, or a headband, or a bow like below, just something that comes naturally to you. If you’re working off of a picture, than you should plan the stitches that you want to use. Something I do when I don’t have a pattern is I zoom in really close. Or, if you’re trying to recreate something you can take a bunch of pictures (Note: A lot of stores don’t let you take pictures of their products). Something I did that helped a lot was I made swatches of various stitches, DC, HDC, SC, Knit, Purl, Stockinette, etc. and I use that as my reference for when make something from a picture. Remember that this should be fun! You’re creating something that’s your own, and that’s awesome! Never forget why you’re crafting, it’s fun! Keep it that way! How do you create your own projects? What’s your favorite thing that you’ve made?